1. Culture-driven dining? Customers will be looking for new experiences. 2. Technology and restaurants? The skills shortage will drive significant change as restaurants look to manage their teams better in the face of declining numbers of people choosing hospitality careers. Profitability will be the megatrend for the next five years. More restaurants are saying that it has never been harder to run a profitable restaurant. Profitability is becoming increasingly important with increasing costs in a lot of areas and some tech companies becoming increasingly aggressive in the fees that they are charging. Culture-driven dining will become increasingly important with restaurants looking for better ways to hire and retain the best staff in order to create the experiences for consumers that they need to create in order to be competitive. More technology in restaurants, especially as there is more tech available that is no cost or low cost that can make a big difference for a small business. 3. Ordering Commoditisation? Menulog, Just Eat, Delivery Hero, Deliveroo, and UrbanEats are changing takeout and delivery fundamentally and it is creating massive cost pressures for restaurants. This will see more restaurants leaving the platforms as well as a consumer backlash as they see decreasing quality from financially struggling restaurants. 4. Lease Innovation? Restaurants will look for different solutions to the traditional lease. Looking at different spaces and an increasing in the ‘shipping container’ kitchen that Deliveroo has pioneered, but with the Restaurants in control of the process. 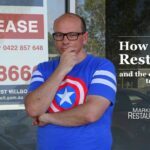 James Eling: Hey, it’s James from Marketing4Restaurants here, and welcome to episode 66 of Secret Sauce, the restaurant marketing podcast. 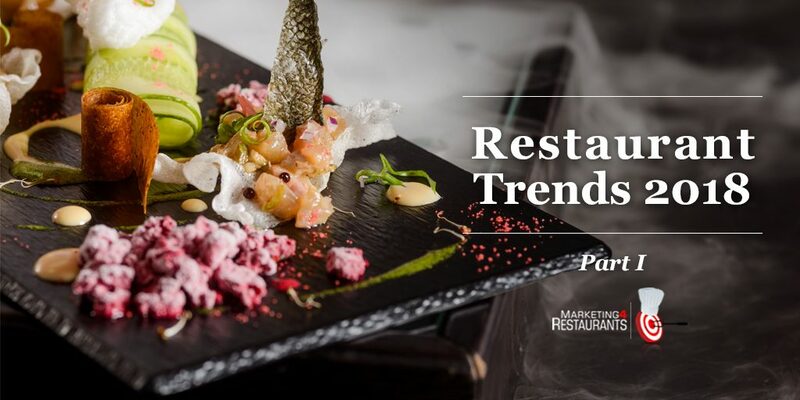 Restaurant trends for 2018. James: Hello, everyone. How are you today? I hope you’re having a glorious day as we start to get the rundown into the busy Christmas time, and then hopefully some time off for everyone. I know it is not too far before we start going on out holidays, which is exciting. So, how did everyone go with their restaurant marketing myths? How many of those did you believe? How many of those have you been thinking about and hopefully changing some of the ways that you do your marketing to make it more effective, and help you to find more customers and turn them into repeat customers? We’re very close to the end of the year, and what we’ve been doing over the last three months is we’ve been reaching out to industry professionals, we’ve been talking to a whole range of restaurants about what it is that they’re seeing in the marketplace, and what they’re planning on doing for 2018. Now, the process that we take to come up with these trends is to really look at the forces that are impacting the restaurant industry. Particularly the independent operators, which is the area that we’re most passionate about helping. And I think, really, when we talk to pretty much to everyone, there were three recurring themes that we found. The first one is changing tastes. So, people are looking at, you know, what’s going to be the new flavour and all of those sorts of things. And I don’t think it’s a changing taste, I think it’s just one of those evolutions. You know, people are always looking for something a little bit new, that’s part of the experience. So, some people are very comfortable having what they’ve been having for the last five years. But there’s always the element of the population that’s looking for a new experience. And, so those tend to form some of the trends that we’ll be seeing over the next 12 months. The next one is the difficulties in workforce management. And we’re seeing it becoming increasingly difficult to find and retain staff. And so, I think that a lot of work is going to be done around that space, because of the reason why it’s so important. You know, it’s a significant, labour is a significant part of the cost of running a restaurant. Now, we’re also seeing the increase in inputs. So, you know, the vegetables, the meat, the fish, all of these things are costing more. Rent is going up. And then, lastly, you’ve got a lot of the tech companies in the industry are becoming very aggressive in their pricing. And I think that this is really going to come to head over the next 12 months. But the mega trend that we’re seeing is going to be the drive for profitability. And I think all of the trends that we’re going to talk about today, people are going to push into these mini trends for the overarching purpose of trying to increase profitability in their restaurant. One of the things that I’ve heard from a lot of people this year is that it’s never been harder to make money in hospitality, and I think that this is becoming a significant issue. The number of people who are quite comfortable is decreasing. The number of people who are now running marginal businesses which two or three years ago were moderately profitable is increasing. And the number of people who are under significant financial stress is increasing, as well. So, it is really quite hard times, but there are people out there who I think are doing a pretty good job of it. And we’ve spent a bit of time talking to these guys, as well. Because what is it that makes them different, literally what is their secret sauce. And that’s what we’re going to share with you today. So, the first think that I think is really fundamental is culture driven dining, and a lot of people talked about this. A couple of years ago you could rely on a stream of people to work in your restaurant, whether in the kitchen or doing front of house. You could pay them minimum wage and it was acceptable to have them stay for 6 or 12 months. And when they left you just replaced them. I think that that’s a bad strategy for a couple of reasons. One, if you’re not looking after your people then they’re not going to be looking after your customers. And we are seeing a really big need for restaurants to be providing an experience which is absolutely amazing. And if you’ve got staff who have been there for six months and probably thinking about what their next job is going to be, they’re not going to be doing what you’re asking them to do. They’re not going to be providing the experience that you want them to provide to your customers. But the problem is that all of these people are in the generic type restaurant. It’s the local Indian restaurant, it’s the local Chinese restaurant, it’s the local burger bar. And those restaurants are becoming increasingly under attack from a whole myriad of areas, which is decreasing profitability. And this is why people are really looking for their team to be a differentiator as they move forward. I read recently that Ben Shewry at Attica, you know, he’s gone to four-day work weeks for work life balance. And that’s fantastic. But let’s be realistic, that’s not appropriate for 99.99% of restaurants. Profitability, look it comes down to profitability, profitability, profitability. You can’t go to four-day work weeks unless you’ve got a massive amount of profitability in your restaurant. So, that’s not going to work for pretty much anyone, I don’t think, apart from that .001% of restaurants. So, what are the other kind of things that you can be looking at? Because your staff can and do make or break your restaurant. So, we’re seeing, you know, people who are trying to put in better conditions, better training, better career progression. And, most importantly, and, most difficulty, better leadership. So, the fish rots from the head down. What is the leadership that is being provided in the restaurant for you? What vision is it that you’re creating for people? These are the kind of things that people are looking for, particularly millennials. You know, it is a little bit different hiring these people, they tend to be a little bit more flighty. So, they are looking for something a little bit more. And I don’t think it’s overly difficult to provide that, it just takes a little bit of care and attention. And we’re going to be talking to a range of people next year about leadership, because it is such a nebulous area particularly in the restaurant industry. And that’s because it is something that hasn’t really been addressed. People think that leadership is yelling at people in the kitchen and belittling them when they don’t cook the sauce just right, or when they oversalt, you know, one of the vegetables. Leadership is not, it’s not that in any stretch of the imagination. It is so much more than that. It’s about aligning people’s needs, wants, and desires with those of the organization. And getting people to do what you want them to do because they want to do it, not because you want them to do it. So, this is going to be an area that I think a lot of attention is going to be paid to. Trying to build a really cohesive team that is all rowing in the same direction. Not easy to do, not easy to do in an industry like hospitality where it is predominantly minimum wage. But we are starting to see people who are running profitable businesses like Ben Shewry at Attica, where they can afford to do those little value-added benefits for the staff. Which helps with retention. And once you start helping with retention, then you’re cutting your training costs. So, what are those little, tiny things that can be done that provide better conditions? And, you know, maybe it’s just around the staff meals that are provided. Can they be jazzed up a bit? Can the benefits of cheap dining for the staff, can that be extended out to family? What are those little, tiny things that can make such a big difference? Looking after the family of your workers in a lot of respects is just as important. Because when someone has a tough day at work, they’re going to go home and then they’re going to their family, it’s like, “Gee, I had a really bad day.” If the family doesn’t know you, if they’ve been in the restaurant, then it’s very easy for them to say, “You should just go somewhere else and get a better job somewhere.” If they know you, if they know that you’re trying to do the right thing and, you know, that it was just a bad day, then you could actually get the family going into bat for you. What are the conditions that you can give to your customers that people aren’t providing? So, in our team we have a corporate massage guy come in once a fortnight to, you know, help destress everyone and help them relax. That’s just one of the things that we can do. Now, the interesting thing is, and I’ve spoken to a few restaurants about this and they say, “Well, we don’t have money to do that.” It’s like, “Yup, I completely get that. But what do you have that could be of value to someone?” Because I bet, you know, there’s a corporate massage guy out there who would like to take his family out for a meal. So, maybe you could trade, maybe you could barter some of the services that you need to create the experiences for your employees that they want. You can trade for those services, and you can provide an amazing experience in your restaurant for someone who can provide you with an experience. And particularly if you’re not full every day, you know, get the massage guy to bring his family in on a Tuesday night, which is your quietest night. You’ve got lots of time to lavish the attention on him that he needs, wants, and deserves. And you’re not giving away any cash paying customers. So, I think that they’re the kind of things that people are going to be thinking about. They’re going to be a little bit more creative in the way that they build that team, because there’s very few people who get that sort of benefit, you know. Is there a local spa retreat that you could do a deal with? 101 things, and I think there’s going to be a lot more work done in this space over the next 12 months to try and hire and retain the best staff that you possibly can. Technology in the restaurant. So, the restaurant industry is notorious for being old fashioned, I think. You know, you talk to a lot of people, the accounting skills aren’t there, the accounting systems aren’t in place. Now, we’ll probably do an entire podcast on restaurant technology, but there’s a couple of things in there that are just really easy and they’re just simple, simple, easy wins. You know, documenting your procedures on something like Confluence. Using an online ordering system. Automating your database collection of your customers. Using something like Slack, so that you can communicate with everyone in your team in a way that’s going to make sense for them. The biggest issue that you have is it’s really hard to get, for most restaurants that are employing 10+ people, it’s really hard to get everyone in for a team meeting. So, how can you get the messaging out about what it is that you want to do? How can they understand what the news is? How do they understand what the specials are? Whatever changes are going on in the restaurant, how can you do that? Now, the thing is as you get an increasingly digitized workforce coming into place, you know, people who are very, very comfortable in dealing with their mobile phone as a means of communication. And I’m not talking about actually on the phone, I’m talking about applications. Then it makes it a lot easier for you to get that message out. You can hit them up all with something like Slack and, you know, you might get 5 or 10 people say, “Yup, got that.” And they’re not even working today, but they’ve got the latest message that’s coming in. Marketing automation tools, accounting tools, you know, using something like Xero so that you can decrease the amount of time that it takes to do our accounting and bookkeeping. 101 things, and I think some of these are very, very clear winners in the amount of time that they save and the benefits that they give. So, I think, you know, Xero’s a really good example of that. Now, obviously it’s a cloud based accounting system, so there are concerns about it being in the cloud. But you can get a bank feed, so it will have all of the money that you’ve paid to. And it’s going to say, “Well, Bob’s meat supplies, this is probably cost a good sold,” and it’ll automatically put it in there against that account. All you’ve got to do is do a little tick rather than typing in all of the information. Big savings in time, and this is the thing a lot of restaurant owners they’re doing the bookkeeping themselves. So, if you’re spending five hours on bookkeeping a month, and you can decrease that down to two hours, that’s three hours back. Now, you know, the 50-50 rule that I like so much – an hour and a half of that you should be spending with your time or doing something for you, and then an hour and a half of that working on the restaurant not in the restaurant. This is one of those things that where you’re investing time not money, and that time will come back. If you’re using that to write up procedures then that’s just win, win, win. Now, the next one, this is a massive one. The online ordering space I think is having a massive impact on the restaurant industry. So, the players that we’re going to be sort of thinking about now, in Australia you’ve got Menulog – Australia and New Zealand – Just Eat, Delivery Hero, Uber Eats, and Deliveroo. So, break them down into the guys who do delivery and the guys who don’t do delivery. So, Menu Log, Just Eat, Delivery Hero, they don’t do delivery. Now, one of the things that we know that they’re looking at is trying to do ways of doing delivery, because they’re charging, you know, 13, 14% commission. Uber Eats, Deliveroo, they’re charging 35%. So, there’s an extra 20% in there if you can handle the logistics component of the actual home delivery. And we think, you know, this is a part that virtually all restaurants really hate because it’s really difficult and it’s outside of your area of expertise. But when you look at what it is that these guys are doing, they’re having significant impacts in the restaurant industry. So, the first thing is that Uber Eats and Deliveroo have introduced delivery to restaurants who never really thought about delivery before. So, delivery has gone up market, which is good but it’s also placed increasing pressure on a new part of the hospitality industry. So, because you’ve got to think about it. If you’re used to like saying a mid-level or a premium restaurant, but now you can get it delivered to you, then that means that there’s going to be less people who are coming into the restaurant. Now, the next thing with all of these guys is that none of them, not one of these companies, hands over the email address of the customer. So, we have to be serious about this. If you don’t get the email address of the customer, then it’s not your customer. So, this is becoming an increasingly big problem, because we are seeing that restaurants with an email database of 5,000 are able to dramatically change ordering patterns. And this is what the ordering aggregators are doing. They’re building up these databases, and they don’t have 5,000 they’ve got 500,000 emails in their databases. They’re absolutely huge. You’re starting to see, so Deliveroo has been admitting to the fact that they’ve been running big data queries over their database. And they’re looking at locations and working out which cuisines aren’t well suited for them and then they’re going into the next trend that we think is absolutely massive, and this is their Ruboxes, you know. So, shipping containers that they’re offering to restaurants to be able to take the restaurant closer to the consumer so that they do a couple of things. One, they decrease delivery times, and they increase the area with which the restaurant can deliver to. So, what is all of this meaning for the restaurant industry? So, there’s a few people who have seen the Facebook live that we did a little while ago, where we talked about the sizes of food. The biggest issue that’s happening is that, so when you order a Vindaloo or a sweet and sour pork you don’t order it by the volume. Now, there are some restaurants out there that will do a small, medium, and large, but there’s not many. Basically, a Vindaloo is a Vindaloo. So, when you enter into that agreement with the customer to provide them with a Vindaloo, you’re not actually saying how much Vindaloo you’re going to ship to them. And I don’t even know how you’d measure it. Is it by weight? Is it by volume? Who knows. But the scary thing is the decrease in size of the volume. So, more and more restaurants are decreasing the portion size to try and win back some of that commission that they’re paying out to the order aggregators. And so, in the Facebook live video we compared some Mandarin pork ribs with a chicken Vindaloo and, like I’m no menu engineering wizard but I would have thought that pork ribs is probably more expensive than the chicken Vindaloo. Particularly when you look at the amount of pork ribs. It was pretty much all pork ribs. And you compare that to a Vindaloo where, you know, there was a lot of Vindaloo sauce there, not a lot of actual chicken. So, I would have thought that the Vindaloo would have been a lot cheaper to provide. So, for virtually the same price you were getting twice as much volume of pork ribs. And the difference between the two restaurants, one was using FROLO, the Free Restaurant OnLine Ordering system, and one was ordered through Menulog. So, the restaurant’s paying the 13% commission. And I think this is one of the things that they’re doing. I had a fascinating conversation with someone in the UK earlier this week, and they were talking about the work that they’re doing with restaurant wholesale supply businesses. And your normal restaurant supply business will have a premium chicken solution, a mid-range chicken product, and the economy, entry level chicken product. And what they’re seeing is that more and more people are going down the value chain. So, they’re moving away from the premium chicken into the mid-range, or from the mid-range into the low-range. And this is this drive to try and get profitability out of a business that is being bled dry by these incredibly high commissions. So, there’s a couple of really interesting things to come out of this story. Now, the first is that we’re starting to see, in Australia and I’ve heard anecdotally from the United States, people trying to move away from Grub Hub and Just Eat. There’s a lot of resistance to Just Eat, a lot of restaurants are looking for alternatives. People are starting to move away from the online aggregators, the Uber Eats and the Deliveroo, as well. Even though they do the delivery component. It’s still not helping. So, restaurants have spent the six months, the 12 months in the system and they’re really starting to find that they just can’t make it economical. So, it is interesting, because talking to restaurants it’s like getting addicted to crack cocaine. It’s high volume, but it takes a while for it to work through the profit and loss particularly if you’re not looking at your food costs and if you’re not doing a weekly PNL, then you can start to really struggle with how much you’re making and what the actual margins are and if it is profitable. So, we are seeing and I think that this trend is going to grow definitely as more and more people move away from the online aggregators. Now, one of the things that I found really interesting was with the video that we did, where we compared the two containers, was I think that there’s going to be a growing backlash from consumers. One of the things that the online aggregators have been working really hard with over the last 12 months is to bring on more of the big brands onto their platforms. So, you know, you can get McDonalds on Uber Eats and Grub Hub are doing deals, all of the aggregators are trying to get in as many of the big chains. And that is just putting more and more pressure on the small independents. So, they’re doing the things like decreasing portion size, changing the menu, using lower value ingredients. And so, we’re getting this really interesting space now where there’s a growing consumer backlash. And we see this, Menulog in Australia they’ve done a really good job of creating the verb ‘just menulog it’. Now, the interesting thing is that we’re seeing more people on something like Twitter, when you look at the Twitter feed, “Menulog’s food’s awful.” Which is really amazing because they don’t actually cook anything, all they are is an aggregator. But we’re seeing this, you know, “I’m never ordering from Just Eat again, because their food’s awful.” You know, same with Grub Hub, same with Uber Eats. People are becoming increasingly disenfranchised with it and it’s because, partially because of decreasing food quality, but I think you’re also going to see a much bigger around volume. And so, you’re going to get this drive from restaurants to take back their customers, and a drive from consumers to take back the restaurant. They’re going to be much more likely to want to deal directly with the restaurant, and we’re going to talk about some of the ways that restaurants are going to do this. Because these are some of the trends, these are what some of the people are actually trying. These are what those trends that are going to come out. But I think it’s going to be a really fascinating place. So, just recently, Deliveroo had a win in a UK court saying that their riders are employees. I think that this is definitely going to be a space where a lot more work is going to be done over the next 12 months. Whether deliver riders are employees or aren’t, I think that’s going to be interesting. But it’s going to be overtaken I think by their detrimental effect that it’s having on restaurants. Now, a lot of consumers are really just interested in getting, you know, the cheapest takeout that they can. But I think that there will be a growing move towards people who want to actually support their local restaurant. Support the restaurant that’s providing employment in their local environment, as well as providing them with food that is all of the things that they’re looking for. You know, healthy, affordable, great tasting, niche, all of those sorts of things. Because they’re the kind of things that you’re not going to be getting as we see the further order commoditisation from the aggregators. Now, following on from that, you’re going to have work being done in leases. We’ve heard from a lot of restaurants who have been complaining about the price of the leases. And this is a global phenomenon I think. You’ve got Deliveroo with their shipping containers. We’re seeing some people starting to experiment with that. I think a lot more work is going to be done around spaces like food trucks, factory kitchens. And so, we’ve actually got customers, we’ve done work this year for factory kitchens, where there is no retail presence. It’s a factory where they’re cooking multiple brands and delivering them straight out. Now, it’s interesting from a marketing point of view, there are a lot of challenges with that. I think that we’re going to start to try and test and adjust a few of the different models. I think one of the interesting things would be a restaurant with a decent number of shop fronts, so very small, almost hole in the wall type things where you can go and pick up your Indian food, your pizza, your burger, and your Chinese food —but all cooked out of the same kitchen. Because I think we’ve seen a few people who have been playing with the delivery only space. And I think the delivery component of it is very difficult, it creates bottlenecks because you’ve got to think most of your delivery orders are going to come on a Friday, Saturday night. So, it’s very peaky. Pick-up removes that issue, particularly if you’re going to put in a high-volume kitchen, that makes it quite interesting. I think we’re going to see a few more of these. We talked about the rise of the factory kitchen, we’re now seeing that. I think it’s going to iterate and try and make it a bit more flexibility, try and decrease some of those costs and be able to maximize through putting in the kitchen. Definitely shipping containers. We’re seeing people really interested now in rooftop spaces, basement, office restaurants, places where you’re going to be able to take advantage of a lease that is distressed in some respects. So, maybe that you’re in an area where there’s too much office space. Can you put a kitchen in there and target the local office space during the day, and then transition to a destination restaurant at night? You’ll be paying much less for the lease because it won’t in a retail precinct, and there’s going to be a big opportunity around that. Because we’ve seen some people playing in that area now, and I think that that’s a trend that’s going to take off. Wow, so we’ve only covered four on our fairly long list of the trends that we’re going to be seeing. So, what we’ll do is we’ll wrap here and we’ll come back next week with the rest of them. So, just recapping. Culture-driven dining, think about the team. People are going to be spending a lot more time treating the team and building the team in a different way than they have been, because of the fact that they’re going to be looking for a different output from the team. Better retention, better customer service, and better experiential dining for their customers. And that’s going to be a really big change in culture for so many restaurants I think. Really starting to see the bigger uptake in technology. It’s been used in the chains for a long time, and the drive for profitability is really going to drive that, and particularly when some of the tools that we’re talking about is actually free for small businesses. And I think things like Slack and Confluence, very easy to do. When you look at the mobile phones there’s so many apps out there that you can do amazing things with that are completely free. So, we’re going to see more of that being done. The order space, the commoditisation, the divergence between good quality takeout, delivery, pickup type restaurants and the ones that are just competing on price where they aren’t building their email marketing database, this is going to be massive. It is unsustainable to have restaurants paying $2,000 or $3,000 a month in commission. This is a fundamental thing. And someone said to me, you know, why is their commission so high? And I said, “Well, I don’t get it.” You know, the restaurant owner, they have the dream of the restaurant, they plan the restaurant, the open the restaurant, they buy the food, they cook they food, they hire the staff, they train the staff, they pay the staff. They do all of those things, as well as all of the other things you need to do in a small business, accounting, marketing, legal, HR, all of those crazy things. And then you’ve got someone who literally just takes an order using a platform and they think that they’re entitled to 13%. Because that 13% commission think about, that’s 13% of your revenue. Think about what it is as a percentage of your profit, because the massive difference is that the amount of commission that they take puts most restaurants into the negative when they start to scale up. You can’t do this at scale, you can’t be doing 50% takeout through an aggregator and be losing, 13, 15, 20%. It’s just madness. So, there’s going to be a lot of movement in that space I think, particularly around the consumer backlash as restaurants try to adapt and try to retain profitability. And then leasing. I think we’re going to see restaurants popping up in all sort of interesting places as they try and come up with innovative ways to manage leasing costs. So, that’s it. We will talk to you next week, we’ve got about another seven trends for 2018. So, that’s it. You have an outstanding week. Bye.